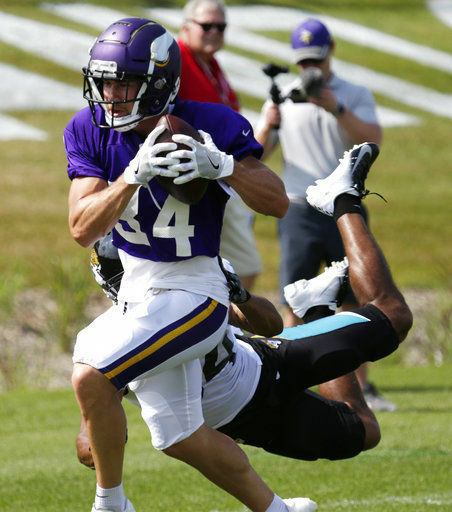 Beebe, the undrafted Northern Illinois product who signed after a tryout in May, is also turning the head of offensive coordinator John DeFilippo as the Vikings look to fill out the bottom of their receiver depth chart for the 53-man roster. It hasn’t been uncommon to see Beebe open against the Vikings reserve defenders in practices. He’s among the shortest players on the roster, listed at what might be a generous 5 feet and 10 inches. That still hasn’t halted him from standing out amid competition for receiver spots No. 4, No. 5 and possibly No. 6 on the initial regular season roster. He led all receivers with 35 snaps in the preseason loss against the Jaguars, and has turned eight targets into four catches for 36 yards and a touchdown in two exhibitions so far. Beebe has been among the “most improved” Vikings players this summer, according to DeFilippo. Beebe has what they call “football pedigree” in the industry, since his father, Don, played professionally for the Bills, Panthers and Packers. Don recently recalled the 107-pound freshman’s football beginnings in this Star Tribune story by Mark Craig. Chad, who if he made the team would follow in the footsteps of Marcus Sherels, Adam Thielen and C.J. Ham as tryout-to-active roster players, is trying to make a name for himself. “He’s an exciting guy to watch,” DeFilippo said. Beebe may see more of his internal competition return in Friday’s exhibition No. 3 against the Seahawks, when receiver Brandon Zylstra might make his preseason debut while working his way back from a hamstring injury. Receiver Stacy Coley has also been continually sidelined due to a trio of injuries this summer.